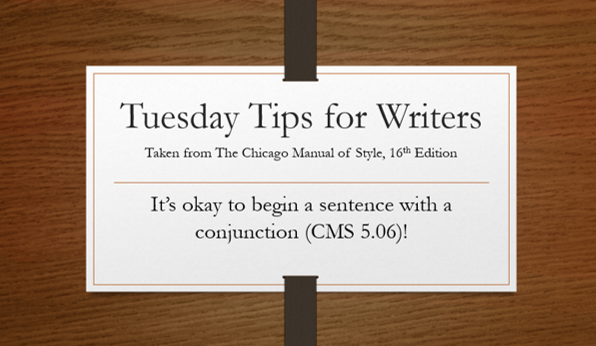 This is a fun bit of trivia I wish I could go back and show my high school English teacher: according to the Chicago Manual of Style 5.206, it’s okay to begin a sentence with a conjunction. A conjunction is a joiner, typically of two sentences or thoughts—and, but, however, therefore, etc. The authors claim that as many as 10 percent of sentences in first-rate writing begin with a conjunction. I feel so vindicated. CMS does caution to test the word to see if it is really needed. In the case of “but,” can the word “and” be substituted for it? If so, it’s the wrong word or it isn’t needed at all. I walked to work today. But I left my briefcase on the table. In this case, the conjunction should be “and” because they are not two opposing thoughts.